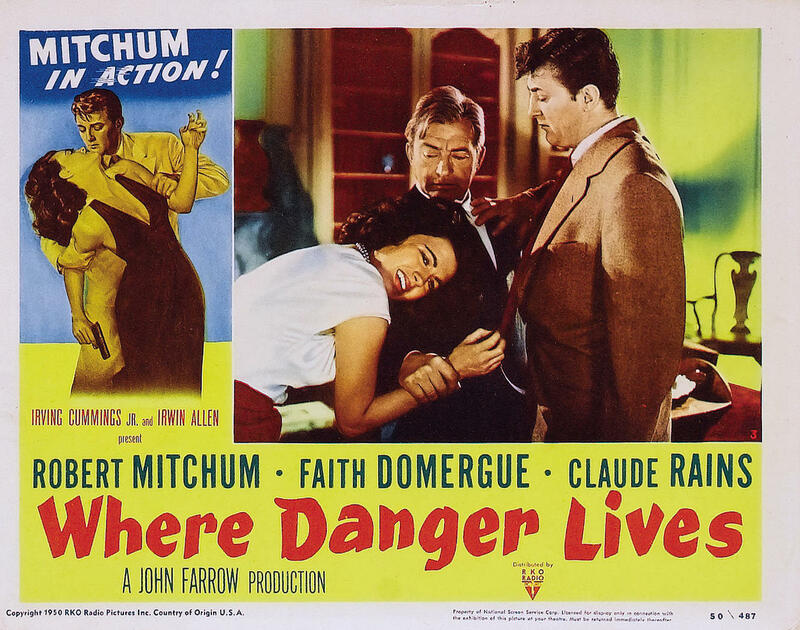 The first time I watched the pitch black Film Noir melodrama, “Where Danger Lives” (RKO Radio Pictures, 1950), it was on account of Robert Mitchum, an actor for whom I have great admiration. Mitchum rarely gave interviews, and when he did, he rarely expressed anything but contempt for Hollywood and the pictures he appeared in. As he told Robert Osborne, “They don’t pay me to see ’em.” With few exceptions, one can hardly blame him: he was in a lot of bad pictures, and few critics in the forties and fifties had any respect for him. James Agee, after having admired Mitchum in several of his early roles (e.g., “The Story of G.I. Joe,” “Crossfire”), accused him of sleeping on the job in “Out of the Past,” a role that probably did more to establish “Mitchum cool” than any other role. (It’s also one of his most enjoyable pictures.) While “Where Danger Lives” is certainly not one of his best efforts, he does a better than creditable job in a nearly impossible role. In the first reel, he gets through a few scenes with some fairly appalling kiddies without looking irritable or indignant. I don’t know how he managed it. Even by Noir standards, the story is far-fetched: young Dr Mitchum, with the help of his girlfriend/fiancee, Nurse Maureen O’Sullivan (she was married to the picture’s director, John Farrow), saves the life of an unconscious young woman named Margo (Faith Domergue), who has tried to commit suicide. Margo repays him by enmeshing him in her spider web. At first, his involvement with her is tentative and unwilling: he plans only to keep the suicidal young woman from being lonely until her wealthy father returns from a business trip within the next week or ten days. But this is Noir, so he falls under her spell. It’s one thing when, in “Nora Prentiss,” Dr Kent Smith, under nearly identical circumstances, falls for femme fatale Ann Sheridan, who promptly leads him to his ruin: Kent Smith was born to play the patsy: something about him makes one instinctively feel like kicking sand in his face. But one does not kick sand in Big Bob Mitchum’s face and get away with it, not even when the assailant is the great Claude Rains. As it happens, the first time I saw “Where Danger Lives,” I missed the opening credits and had no idea Rains was in it. I found the scenes of Dr Mitchum’s stepping out with the psychotic Margo so unpleasant and depressing that I was on the verge of changing the channel when suddenly the immortal Claude hove into sight. We hear his unmistakable voice just before we see him, and the sound of that velvet and gravel purr made me sit up with a jolt of excitement. Here he is, in tip-top form — as superb as he was as Alexander Hollenius in “Deception” and Alexander Sebastian in “Notorious,” but with lower quality dialogue to speak. In this picture, Rains demonstrates his uncanny ability to create a first rate characterization out of third rate material. Rains handles mid-line pauses better than anyone. In the scene below, you’ll hear how it’s the cæsuræ he inserts into nearly half of his lines that really make his character come to life. And he’s perhaps the only actor I know of who can actually whisper a line and make it sound honest, instead of like a cheesy actor’s trick. “The point’s irrelevant. Good night . . . Dr Cameron.” The first sentence he whispers — to remarkably sinister effect. In the second one, he inserts a meaningful cæsura, which gives it extraordinary insolence. In this next clip, which ends the scene, he turns truly nasty. When Claude Rains brandishes a poker, there is magic in the air. If there were nothing else good about this picture, I’d still love it for Rains’ performance. For much of the rest of the picture, Dr Mitchum (now badly concussed and going in and out of delirium) and the mad, bad, dangerous Margo are lamming it through a nightmarish California landscape where scumbags are to be found behind every cactus: swindlers, blackmailers, human traffickers and, lowest of all, used car salesmen: Where Danger Lives. Until they get to Mexico, it’s an all-White cast, but to paraphrase Rachel Dolezar, it identifies as Bleak. The whole story is more than a little cockamamie, since Dr Mitchum is so clearly intelligent and Margo is so obviously manipulative and — to my eyes, anyway — seriously deranged. When Mitchum fell hard for Jane Greer’s helpless act in “Out of the Past,” their relationship developed gradually and more credibly, he wasn’t already in love with someone else, and her innocent act was entirely convincing. This one forces you to overlook a lot of improbables. But it has a nice pay off if you do. 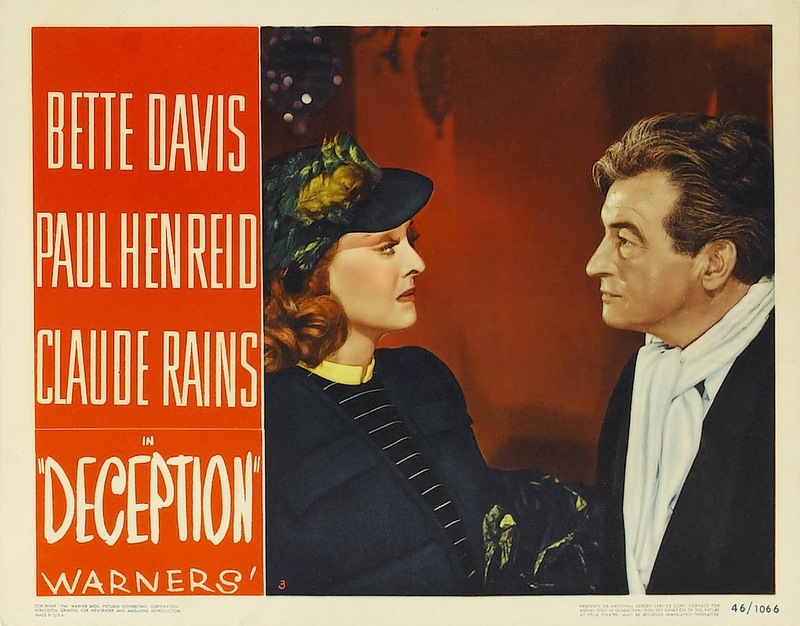 And of course there is Claude Rains, who is reason enough to see it. This entry was posted in Main and tagged Alexander Hollenius, Alexander Sebastian, Ann Sheridan, Claude Rains, Crossfire, Deception, Faith Domergue, James Agee, Jane Greer, Kent Smith, Maureen O'Sullivan, Nora Prentiss, Notorious, Out of the Past, Rachel Dolezar, Robert Mitchum, Robert Osborne, The Story of G.I. Joe, Where Danger Lives on July 7, 2015 by TR.